Ideal for your sports team, this custom hooded sweatshirt delivers optimal comfort with smooth finish fabric and contrast draw-cord for added style. The GILDAN Premium Cotton Hooded Sweatshirt is a stylish and comfortable hooded custom sweatshirt that’s ideal for sports team. The 75% Cotton / 25% Polyester blend is made with ring spun cotton delivering a nice smooth and soft feeling custom hoodie. A contrast dark grey twill tape at the back neck and flat-cord adds visual interest and a front pouch pocket provides additional comfort and style. Width: Place the tape measure under your arms at the fullest part of your chest, wrap around your body until your fingers meet and mark the measurement. Length: Measure from top of shirt at the back of the neck to the bottom hem. Sleeve Length: Start at the centre back of the neck, measure across the shoulder to the elbow and down to the wrist. Round up to the nearest half inch. 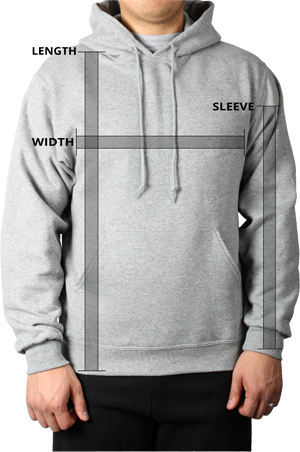 *This sizing chart measurements are closest approximation with a 1/2 inch variance.